The “McConaissance” still has a little bit of life left in it, despite flops like Free State of Jones and Sea of Trees all but undermining Matthew McConaughey’s resurgence as an actor-for-hire to an award-winning thespian. Take Gold for instance, in which McConaughey gives everything he’s got in a larger than life role that seems to mix Daniel Plainview from There Will Be Blood with Christian Bale’s character in American Hustle, and in doing so creates more of a spectacle than the otherwise okay film surrounding it deserves. McConaughey is Kenny Wells, a balding and slightly overweight mining businessman – which, between this and his dramatic weight-loss for Dallas Buyers Club, you really have to feel some sympathy for his gut at this point – who’s down on his luck, unable to make enough money to keep his father’s company or even his own life afloat. After experiencing a dream of the unchartered Indonesian jungles, Wells teams with geologist Michael Acosta (Édgar Ramírez) on a trek to said jungle, and eventually end up striking gold beyond their wildest dreams. Back home, his business dealings afterwards puts him in the big leagues, but everything threatens to go down the drain when greedy investment bankers and unexpected betrayals end up side-swiping him where it hurts. The film is very loosely based on the real-life mining scandal during the early 1990s involving then-prosperous company Bre-X, but this film had the names of characters and story details wildly altered to expand its appeal. A much more interesting film about that exact event could be made, but Gold is a little too all over the place to really stand firmly on its own two feet. It takes a while for this film to decide what exactly it wants to be, starting out as an adventure film in the same vein as The Treasure of the Sierra Madre when Wells and Acosta go out searching for the gold, but then turning into something that’s an uneasy hybrid of The Wolf of Wall Street and American Hustle, and not once does the film ever really settle for something that’s not so conventional. It comes down to being a basic rags-to-riches-to-rags-again story that’s been done to death, and not enough interesting material has been injected into the story to make it stand out from among the many other films like it. It’s odd, because director Stephen Gaghan previously made oil drama Syriana, which took a few more risks to tell an unnerving story about industrial corruption and espionage, whereas Gold plays things perhaps a bit too safe for its own good (then again, maybe that’s because Gaghan didn’t also write this one as he did with Syriana). Even though the film and its overall script may be conventionally standard, arguably the best thing about the entire film is McConaughey’s performance. He is clearly having a ball in scenes that require him to go over the top, and reminds us all that within that surfer dude exterior is a genuinely engaging actor who, with the right material, can truly shine. Wells is already a larger-than-life character, clearly exaggerated for a more fictional setting as opposed to whoever his real-life counterpart may be, and McConaughey manages to make him an entertaining figure to watch on-screen, even in scenes where he’s actively making one dumb decision after another. You can understand why certain characters are attracted to his persona, because of how the actor makes the fiery passion effortlessly charming, but also confused as to why certain characters would end up betraying him with motives that seemingly come out of nowhere by the end – but again, maybe that’s just the script writing itself into a corner. 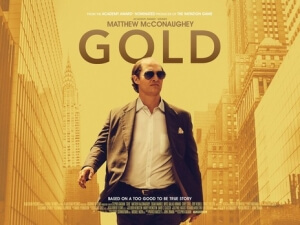 Gold boasts an entertaining and committed lead performance by Matthew McConaughey, but is otherwise a safe and standard rags-to-riches story that isn’t interesting or edgy enough to leave much of an impact in the long-term.